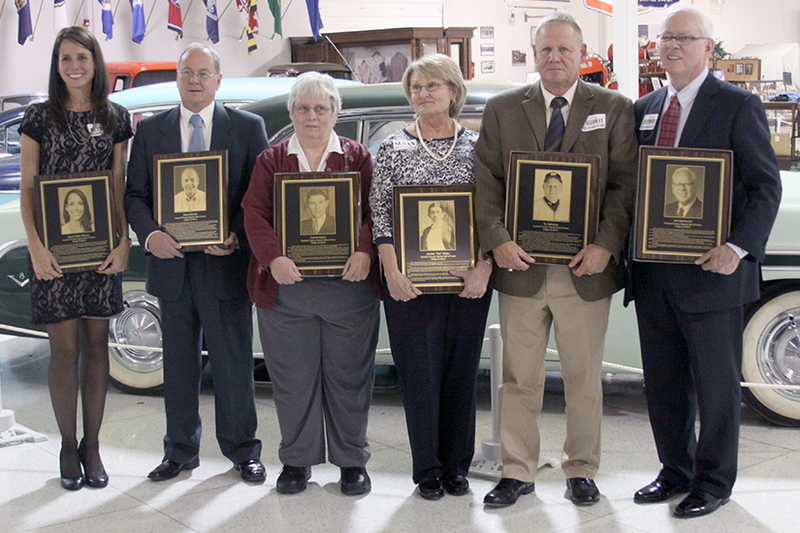 And that is how the evening went as the Howard County Sports Hall of Fame inducted seven new members into its fold. Sports legends Ty Calloway, Art Hammond, Dave Kitchell, Pat Kubly, Carroll Odom, Kylee Wells-Retrum and James “Tod” Sloan all brought their own unique prowess to Howard County athletes – either as a member of a team, playing as an individual, riding a horse or, in one case, writing about it. Nearly 230 sports enthusiasts gathered at the Ivy Tech Event and Conference Center for the 11th annual induction banquet. Each year since 2003, the organization has inducted six or seven worthy athletes, coaches or contributors. With the 2013 class, 70 inductee plaques now dot the landscape of the main hallway inside the Ivy Tech facility. All 70 plaques are open to the public for viewing without charge during normal Ivy Tech business hours. Art Hammond is widely considered the best all-around athlete to ever play for the Eastern Comets. The 1961 graduate was the MVP of the baseball team, earned All-State honorable mention honors in football, led the basketball team to a ranking as high as No. 13 and held the school’s shot put record for 51 years. He was the first athlete to be awarded the E Blanket for achieving 12 varsity letters (he actually earned 13). Hammond recalled the 1960-1961 season that featured two of the top teams in the state of Indiana – the Comets and the Kokomo Wildkats. Eastern started the season 13-0 and nearly climbed into the Top 10. Unfortunately for Eastern, they hit a peak at the same time as Kokomo, and the Kats would win its only boys basketball state title that season. Hammond and his wife of 50 years, Joyce, have four children and live in Kennesaw, Ga.
Dave Kitchell has had the honor of writing about every student-athlete who passed through a high school in Howard County from 1970-2010. He is a member of the Indiana Sports Writers and Sportscaster Hall of Fame, was named the 1992 Indiana Sportswriter of the Year and earned honors from the Indiana High School Athletic Association, North Central Conference and Associated Press. When not writing, Kitchell managed a Kokomo Parents Babe Ruth team in 1976 that won the league’s first Indiana all-star state championship. He was also instrumental in bringing the 1985 American Legion World Series to Kokomo. “When I started, I had no idea the opportunities that would be afforded me over 40 years,” said Kitchell. “I was in Toronto in 1979 when Kokomo’s Major League pitchers, Tom and Pat Underwood, faced each other in a 1-0 game that was nothing short of classic. I wrote about the Pacers and Colts and the Indy 500 and the Indiana Hoosiers when they were winning national championships. I covered the American Legion World Series and the Olympic Games. Kitchell and his wife, Linda, have two grown children and reside in Kokomo. Kylee Wells-Retrum is simply the best diver to ever come out of Howard County. While she started her athletic career as a gymnast, it was in the pool – and the air above it – where she gained fame. During her senior season at Western, she was crowned the 2000 IHSAA 1-meter diving state champion – and in the process became the first female individual state champion from the school. She continued her career at the University of Tennessee where she was named the 2001 Southeastern Conference Freshman Diver of the Year. As a Volunteer, Wells-Retrum earned a pair of All-American distinctions after finishing fifth in the 2001 10-meter platform and 11th in the 2003 platform NCAA Championships. She was also the SEC platform champion in 2003. The diving specialist said she had the opportunity to travel across the United States, and Kokomo will always be the place she calls home. Wells-Retrum and her husband, John, reside in Louisville with their 1-year-old son. When it comes to coaching baseball, Ty Calloway is a state legend as he is already a member of the Indiana High School Baseball Coaches Association Hall of Fame. His 663 wins at Western High School are a Howard County record. But it is one win that will always remain special – the 2012 IHSAA Class 3A state championship team in which the Panthers won the school’s first baseball state title. During his 36 year coaching career at Western, Calloway won 17 Mid-Indiana Conference championships, 16 sectional titles and hoisted six regional trophies. Eleven of his players were named to the Indiana All-Star squad. As a 1968 graduate of Western, Calloway was also a member of the first MIC title team. Calloway and his wife, Dallas, reside in Kokomo and are the parents of two grown daughters. Born in Bunker Hill in 1874, James “Tod” Sloan crew up in Kokomo and would become an international horse racing champion at the turn of the century. He raced his first horse to a win at the age of 15, won 46 percent of his races in 1898, and earned titles at the 1899 1,000 Guineas and 1900 Ascot Gold Cup in England. In 1900, Edward, Prince of Wales offered the American legend the opportunity to race for the royal stables. He also popularized the “monkey crouch” style of riding a horse that is the standard today. Sloan died in Los Angeles in 1933. He is a 1955 charter member of the National Thoroughbred Racing Hall of Fame. Sloan’s mother and brother are buried in Crown Hill Cemetery in Kokomo. Carroll Odom was a member of the powerful Kokomo High School track and field team during the 1920s. During a 14-year span from 1924-1937, Kokomo won seven IHSAA state team titles and two dozen individual championships. In 1927, the junior scored 12 of the Kats 30 points to claim the state team championship. Odom won the 220-yard dash while taking second in the long jump and third in the 100-yard dash. In 1928, he won the state long jump and was a member of the championship 880-yard relay team. He also finished second in the 100-yard and 220-yard dashes as the Kats finished as state runners-up. He continued his track career at Purdue University, where he tied for first in the Big Ten Conference freshman meet. He earned letters at Purdue in 1930 and 1931. Odom passed away in 1975. He is also a member of the Indiana Association of Track and Cross Country Coaches Hall of Fame. Pat Kubly swam at Kokomo High School for fellow Hall of Famer Mal Cofield. And there is a reason they are both in the Hall – championships. Kubly was a four-time IHSAA state swim champion. He won the 100-yard backstroke in 1965 and 1966 and the 200-yard individual medley in 1963 and 1965. In the process he broke three IHSAA state meet records and helped propel the Wildkats to the state runners-up finish in 1965 – the same year he was named to the National Interscholastic Swimming Coaches Association High School All-American Team. He continued swimming at Indiana State University, where he finished fourth in the 200-yard backstroke at the 1968 NCAA College Division Championships. Kubly is also a member of the Indiana Swimming and Diving Hall of Fame. He was unable to attend the Howard County induction banquet. For more on the Howard County Sports HOF, visit www.howardcountysportshof.com.